The Nautica Queen can be chartered for corporate functions, weddings and receptions, showers, birthday parties, anniversaries, holiday celebrations, club outings, business meetings, family and military reunions, bar & bat mitzvahs, proms & after proms, and sorority or fraternity formals. The ship is a luxury cruise dining vessel featuring two enclosed decks, spacious open-air observation decks, and has been designed to meet all your entertainment needs. Whether you are planning an intimate get together of family and friends or a grand affair for 330, the only limit is your imagination. 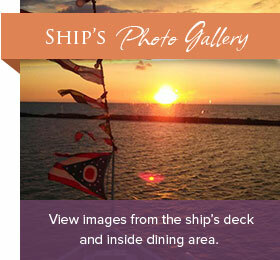 Click on cruising packages to view detailed information. For additional information, questions or to plan your event with us, call 216.696.8888. A group consists of 25 people or more. Once you have contracted through group sales, all policies pertaining to cancellations and refunds will apply, even if the actual attendance falls below twenty-five guests. Unless the Nautica Queen is fully chartered, there is no exclusivity of the usage of the vessel by any passenger on board. All areas and decks are considered common to all passengers. All food and beverage served on board must be purchased through the Nautica Queen. The minimum number of passengers needed to charter a cruise during the normal cruising schedule (or the equivalent payment) is as follows: Full Ship 310, Upper Level 125, Main Level 185. All charters will cruise the normally scheduled length of time for the cruise booked. If available, any additional time required for dockside usage or cruising will be charged as follows: $800/Half-hour $1600/Hour. In addition to our regular schedule of daily lunch and dinner cruises, the Nautica Queen may be chartered during non-scheduled times. Monday-Friday: Board/7:30 a.m.; Cruise/8:00-10:00 a.m.
Monday-Friday: Board/2:45 p.m.; Cruise/3:00-5:00 p.m.
Saturday: Board/2:00 p.m.; Cruise/2:30-5:00 p.m. Mon.-Thurs. : Earliest Board/11:15 p.m.; Cruise/11:30 p.m.-1:30 a.m.
Fri. & Sat. : Earliest Board/11:45 p.m.; Cruise/12:15 a.m.-2:45 a.m.
Sunday: Earliest Board/5:00 p.m.; Cruise/5:30 p.m.-8:30 p.m.
Reservations are not considered definite until a deposit and signed contract have been received. Reservations made prior to the cruise season require a 10% deposit and a signed contract within 10 days after the date of booking. Additional deposits totaling 50% are due by March 1st of your scheduled cruise season. Failure to provide additional deposits as indicated on the contract will cancel the reservation. The actual payment schedule will vary based on the booking date. Reservations made during the cruise season require a 50% deposit and a signed contract within 10 days after the date of booking. No refund of previously received deposits will be given. The balance of the cruise price is due prior to boarding. No guest from the group will be permitted to board prior to receipt of full payment. Payment must be made with a major credit card, cashier’s check or cash. We will not accept personal checks nor will we direct bill. Payment of all beverages and on board expenses are due prior to departing the ship at the end of your scheduled cruise. A guaranteed number of guests is due 3 business days prior to the date of your cruise. The final payment will be based on the number of guests guaranteed. Should you have additional guests, you will be charged accordingly. No future credits or refunds will be given for a decrease in the actual number of guests the day of your cruise. The final guarantee cannot decrease more than 10% from the original contract. Please contact the group sales office before increasing the number of guests from the initially contracted figure or the final guarantee. Your request will be given priority consideration on a space available basis. An 18% gratuity will be added to all additional food and beverage costs requested and hosted by your group. Applicable state and local taxes will be added to all cruise package prices as well as additional food and beverage costs. An automatic 18% gratuity will be applied to all cash bar sales with parties of 8 or more. An automatic 10% meal gratuity will be applied to all cruise packages. Group – Prior to 30 days of cruise – total refund of any prior payments, less 10% of originally contracted and estimated total cruise price. Within 30 days of cruise – no refund of any prior payments (or 50% of estimated total cruise price). Ship or Deck Charter – Prior to 90 days of cruise – total refund of any prior payments, less 10% of originally contracted and estimated total cruise price. Within 90 days of cruise – no refund of any prior payments (or 50% of estimated total cruise price). In the event of hazardous weather conditions or unforeseen operational problems, the Nautica Queen shall have the right to cancel any cruise at any time prior to said cruise without any notice to the customer. This contract shall be null and void. Should this occur, you may, as your sole remedy, either reschedule your cruise to an open time or be fully refunded for any payments made. Security personnel and a damage deposit are required for Bar/Bat Mitzvahs, student functions and any events starting after 8 pm. The Nautica Queen reserves the right to require security personnel and damage deposit on any cruise at the ship’s discretion. Security personnel will be supplied by the Nautica Queen at an additional cost to the group. The damage deposit may be refunded, in whole or in partial, pending an inspection of the ship following the event. Group boarding passes will be given to a single representative from your group. The BALANCE DUE and number of passes given will be based upon the 72 hour guarantee. The representative for your group can come directly into the ticket office to receive passes. All outstanding balances MUST BE PAID IN FULL before passes will be allotted. The group representative will be responsible for the distribution of passes. No guest will be permitted on board without a pass. The dining decks of our ship are completely enclosed and climate controlled, therefore, the Nautica Queen can comfortably accommodate its passengers in the event of inclement weather. The Nautica Queen cruises rain or shine. An ample parking lot managed by AMPCO Parking is located next to the Nautica Queen ticket office. Parking is not included, and may be purchased at the posted rates. Cruise departures are on a strict schedule. The Nautica Queen will not be responsible for cruises missed due to traffic, parking, illness, etc. Although we do not adhere to a strict dress code, we do request that our guests use their discretion in following our “Fine Dining /Business Casual” atmosphere. The Nautica Queen cannot lawfully administer medication for any ailment including motion sickness. We strongly recommend, for the comfort of the group, that you provide for this possibility. Guests will not be allowed on board with food or beverage (except wedding cake). The Nautica Queen is not responsible for lost or stolen items.